Neutrinos are the most elusive particles having extremely weak interactions with all other particles. They have rather unusual properties and are even expected to be identical with their own antiparticles. So far this property is, however, not experimentally verified even though many studies of neutrinos over the last 60 years have already boosted our understanding of elementary particle physics. 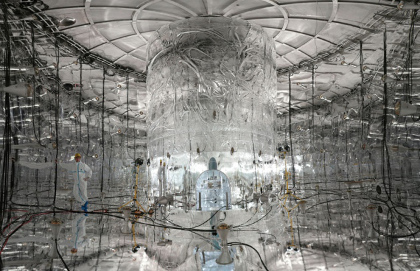 Now scientists of the GERDA collaboration obtained new strong limits for the so-called neutrino-less double beta decay, which tests if neutrinos are their own antiparticles. The result has various important implications for cosmology, astrophysics and particle physics and it adds information about neutrino masses. Besides photons, neutrinos are the most abundant particles in the Universe. They are often called ‘ghost particles’, because they interact extremely weakly with matter. They are therefore an invisible, but very important component of the Universe, which could carry altogether as much mass as all other known forms of matter, albeit traveling almost at the speed of light over fantastic distances. Their tiny masses have also important consequences for the structures in the Universe and they are the driving element in the explosion of Supernovae. But their most remarkable and important property has been proposed by Ettore Majorana in the 1930ies: Unlike all other particles that form the known matter around us, neutrinos may be their own antiparticles. The GERDA (GERmanium Detector Array) experiment, which is operated at the Laboratori Nazionali del Gran Sasso underground laboratory of the Istituto Nazionale di Fisica Nucleare in Italy, is aiming to resolve the question whether neutrinos are in fact their own antiparticles, and to determine their mass. GERDA looks for so-called double beta decay processes in the germanium isotope Ge-76 with and without the emission of neutrinos, the latter being a consequence of the Majorana properties. In normal beta decay, a neutron inside a nucleus decays to a proton, an electron and an antineutrino. For nuclei like Ge-76, normal beta decay is energetically forbidden, but the simultaneous conversion of two neutrons with the emission of two neutrinos is possible and has been measured by GERDA recently with unprecedented precision. This is one of the rarest decays ever observed with a half-life of about 2*1021 years, which is about 100 billion times the age of the Universe. If neutrinos are Majorana particles, neutrino- less double beta decay should also occur at an even lower rate. In this case, the antineutrino from one beta decay is absorbed as neutrino by the second beta-decaying neutron, which becomes possible if neutrinos are their own antiparticle. In GERDA germanium crystals are both source and detector. 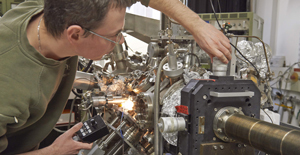 Ge-76 has an abundance of about 8% in natural germanium and its fraction was therefore enriched more than 10-fold before the special detector crystals were grown. Searching for a needle in a haystack is trivial compared to the detection of double beta decay, since environmental radioactivity is a background occurring at a rate at least a billion times higher than double beta decay. The GERDA detector crystals and the surrounding detector parts were therefore very carefully chosen and processed. 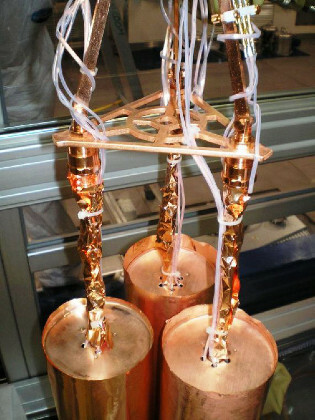 The observation of the extremely rare process requires in addition very delicate techniques to further suppress backgrounds from cosmic particles, natural radioactivity of the surroundings and even the experiment itself. The scientists met this challenge by mounting the detectors in the center of a huge vessel that is filled with extremely clean liquid argon, lined by ultrapure copper, which in turn is surrounded by a 10-meter-diameter tank filled with highly pure water; the whole located underground below 1400 meter of rock. Combining all these innovative and pioneering techniques it was possible to reduce the background to unprecedented levels. Data taking started in fall 2011 using 8 detectors the size of a tin can and weighting two kilograms each. Subsequently, 5 additional detectors were commissioned. Until recently, the signal region was blinded and the scientists focused on the optimization of the data analysis procedures. The experiment has now completed its first phase with 21 kg∙years of data accumulated. The analysis in which all calibrations and cuts had been defined before the data in the signal region were processed, revealed no signal of neutrino-less double beta decay in Ge-76 which leads to the world’s best lower limit for the half-life of 2,1*1025 years. Combined with information from other experiments, this result rules out an earlier claim for a signal. The new results from GERDA have interesting consequences for the knowledge on neutrino masses, extensions of the standard model of elementary particle physics, astrophysical processes and cosmology. The next steps for GERDA will be to add additional newly produced detectors effectively doubling the amount of Ge-76. Data taking will then continue in a second phase after some further improvements are implemented to achieve even stronger background suppression. Today Prof. Stefan Schönert (TUM) presented the new findings at the “Laboratori Nazionali del Gran Sasso” in Italy. He has been the spokesperson of the collaboration since its inception in 2004 and is full professor at the Chair for Experimental Astro Particle Physics at the Physik-Department of TUM. He is also one of the initiators of the experiment (and collaboration). 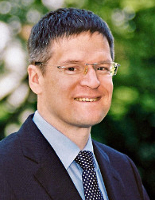 The contributions of Stefan Schönert and his group include the conception and the design of the reduction of the radioactive background, which is one of the main prerequisites of the experiment. His group made major contributions to the detector technology of how to operate ‘naked’ germanium single crystal detectors reliably in liquid argon as well as to the data processing and physics analysis. Currently the focus of the group lies on the preparation of GERDA Phase II. He and his team is coordinating the development of novel germanium detectors and are developing the instrumentation of the liquid argon as an active veto system to further reduce background events. 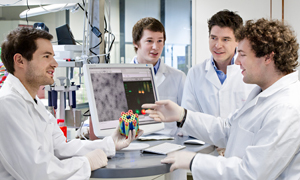 Their work, carried out at Physik-Department, at the Excellence Cluster Structure and Origin of the Universe and at LNGS was supported by DFG and the BMBF. GERDA is a European collaboration with scientists from 16 research institutes or universities in Germany, Italy, Russia, Switzerland, Poland and Belgium. The participating institutes are the Max-Planck-Institute for Nuclear Physics in Heidelberg, the Max-Planck-Institute for Physics and the Technische Universität München in Munich, the universities of Tübingen and Dresden, INFN LNGS at Gran Sasso, INFN Milano, INFN Milano Bicocca, INFN Padova, INR, ITEP and Kurchatov Institute in Moscow, JINR Dubna, the universities of Zürich and Cracow and IRMM Geel. 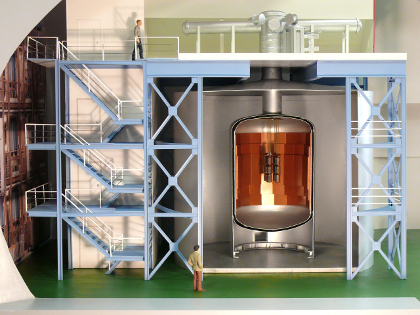 The GERDA experiment is supported by the Max Planck Society (MPG), the German Federal Ministry for Education and Research (BMBF), the Italian Istituto Nazionale di Fisica Nucleare (INFN), the German Research Foundation (DFG) via the Excellence Cluster, the Polish National Science Centre (NCN), the Russian Foundation for Basic Research (RFBR), and the Swiss National Science Foundation (SNF). The participating groups also acknowledge internal financial support by their respective institutes. The GERDA collaborations thanks the directors and the staff of the LNGS for their continuous strong support.